A charity poker event got an appearance from Kim Kardashian and will reportedly be featured on TV. Charity poker events have been a tried and true way of raising money for good causes over the past couple of decades, and one in California got an extremely famous participant on Sunday night. Reality TV superstar Kim Kardashian West made an appearance at "If Only," a charity poker tournament held at The Forum in Inglewood. If Only raised money to benefit City of Hope, a cancer-focused, non-profit research center and hospital. Learn more about City of Hope here. The event, which also featured raffles and high-dollar food and drinks, will reportedly be featured on a future episode of the hit show Keeping Up With the Kardashians. Kardashian West documented the night on her Instagram, showing off pictures of eclectic stacks of poker chips. Prizes available included VIP access for four to an Eagles concert at The Forum, VIP access for four to Fleetwood Mac at The Forum, and custom-fitted Callaway golf clubs and special jewelry. 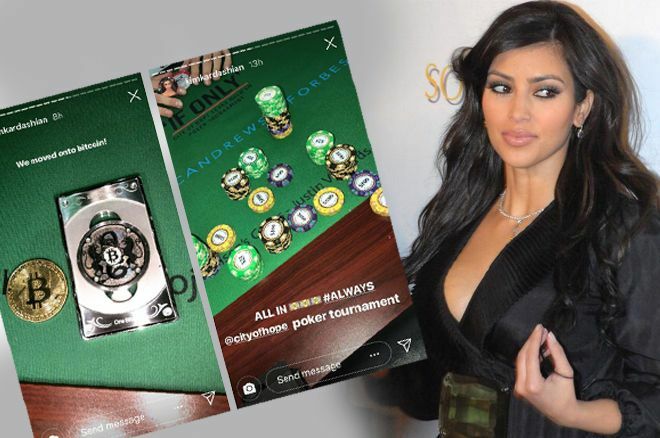 Furthermore, the poker felt wasn't the only thing Kardashian West featured on her much-followed Instagram account that poker players will recognize. According to CoinTelegraph, she also flaunted some Bitcoin fluency as well. Kardashian West was apparently given her first Bitcoin by a cryptocurrency enthusiast who attended the event. She posed for a photo with a physical representation of a Bitcoin — that such an idea goes against the very notion of Bitcoin notwithstanding. She then appeared to put it at risk in the poker game, though CoinTelegraph didn't report whether she managed to hang on to it. Given her reported net worth of $350 million, she'll likely be fine either way.